Former Prime Minister submits application to the Prison Service asking for a reduction of his sentence in the Holyland affair. Former Prime Minister Ehud Olmert has submitted an application to the Prison Service asking for a reduction of his sentence, Channel 10 News reported on Wednesday. 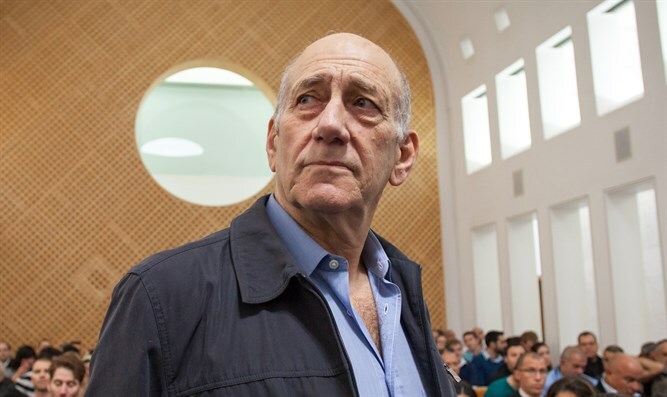 According to the report, the request concerns the punishment imposed on Olmert in the Holyland affair, as he is still awaiting the Supreme Court's decision in his appeal in the Talansky affair. The Parole Board will discuss Olmert's request on December 25, according to Channel 10 News. The former Prime Minister was sentenced to 18 months in prison for bribery and fraud in the Holyland affair. According to the Channel 10 report, the Prison Sentence will likely not object to shortening Olmert's sentence, and the question that remains is whether the prosecution will object. Even if the request is granted, Olmert may not be released immediately because of the need to await a decision in the Talansky appeal. Olmert was sentenced to eight months in prison in that case.